My hand-painted reclaimed vacuum tubes are finally for sale online! 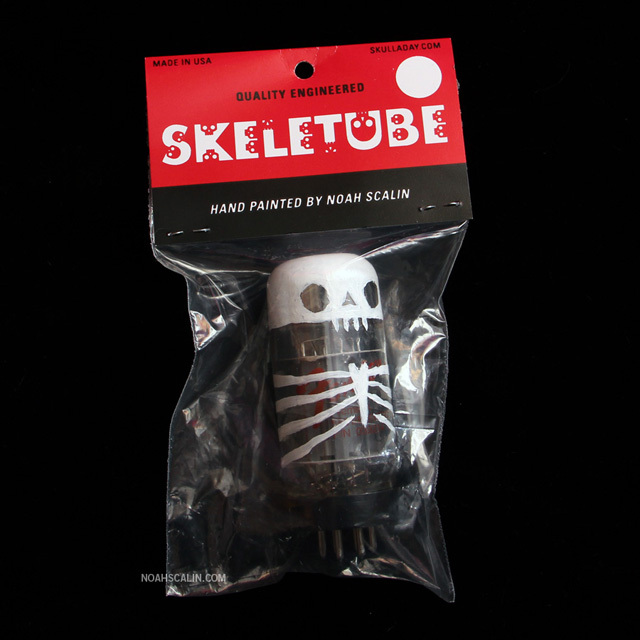 At the Skeletubes store you'll find several versions of the minimalist Skeletube Army in a nifty bag/tag package. 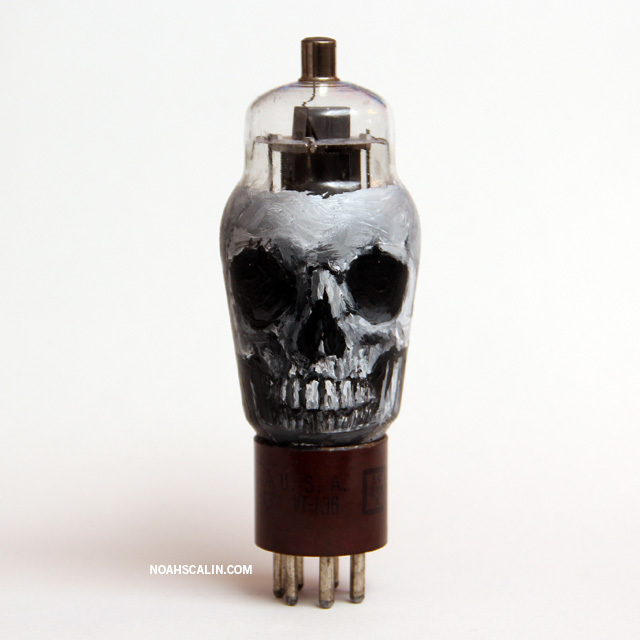 You'll also find the highly detailed one-of-a-kind brainac style tubes. Be sure to check the store from time to time as I'll be adding new variations and packaging in 2013! Wolfgang Sangmeister from Hamburg is back. He created "this painting is 140 x 100 cm acrylics on canvas after the oil painting from Velázques." I wasn't familiar with the painting inspiration, so I searched for it. It is "The Coronation of the Virgin" by Diego Velázques. If you are familiar with Christian iconography, you will probably recognize Mary in the center, with God to the right, and Jesus to the left. The little skulls at the bottom are the cherubs in the original. 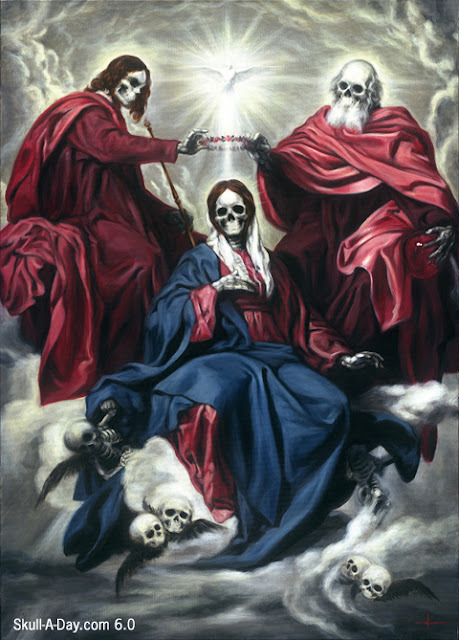 I'm not big on religious paintings, so of course I prefer the skull version. It's remarkable how similar the two paintings are. Wolfgang's version is simply beautiful. 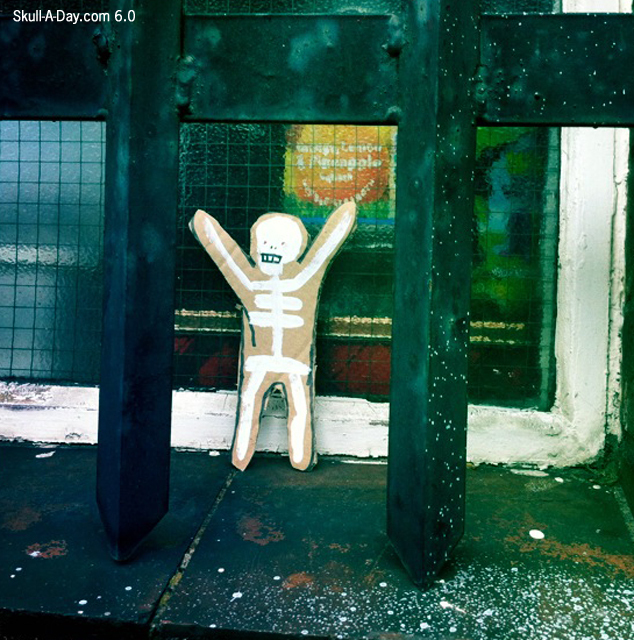 Today's simulacra are from December 21, 2012... a day we will all remember for other reasons. 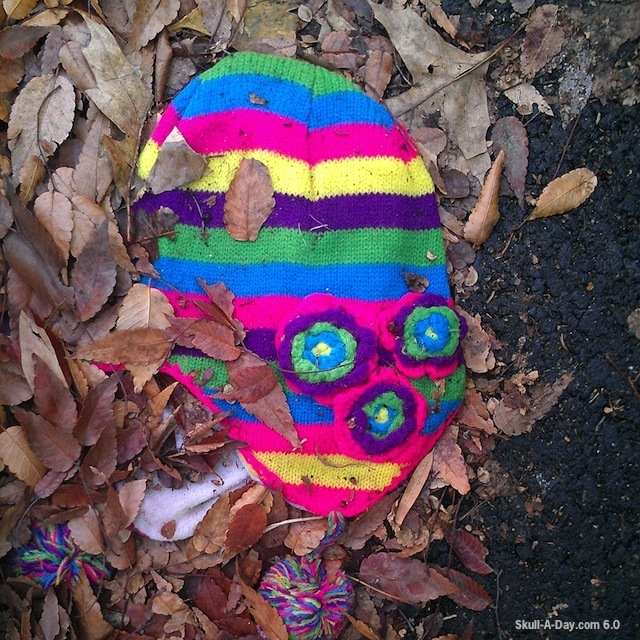 First up is our The Skullmaster who said: "I was just stepping out of a car when I found this colorful fellow staring up at me!" 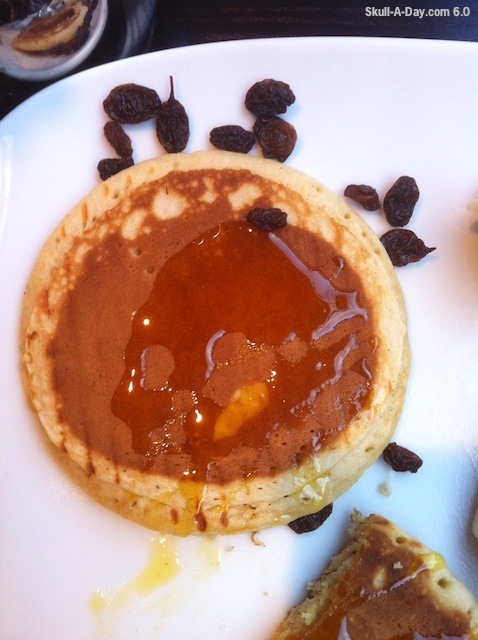 Next is Cozette McCreery in London, UK from Sibling, who showed us her breakfast. 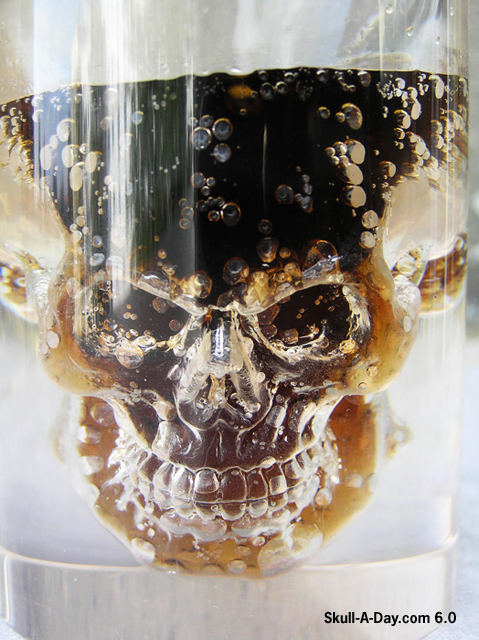 She explained: "This sweet (literally) "End Of The World Syrup" skull was found on a pancake on December 21." Thank you both for playing along with us and sharing your finds. We may not have witnessed the end of days, but you did get some great shots to remember the day. As we come to the closing of the year, may simulacra simile on you are we begin anew once more. This contest has ended. Thanks to everyone who submitted a comment! 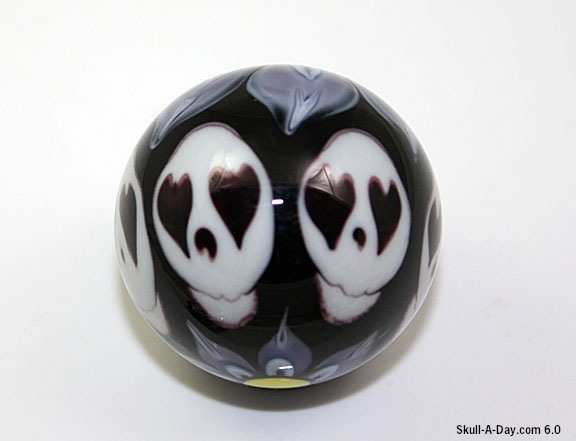 Don't forget that you have until 11:59:59 PM Eastern Time Wednesday January 2nd to enter our latest giveaway contest for a Drop Dead Skull Glass from the Cute Cube Collective. Of course you don't need to wait for our contest to end for a chance to be a winner. 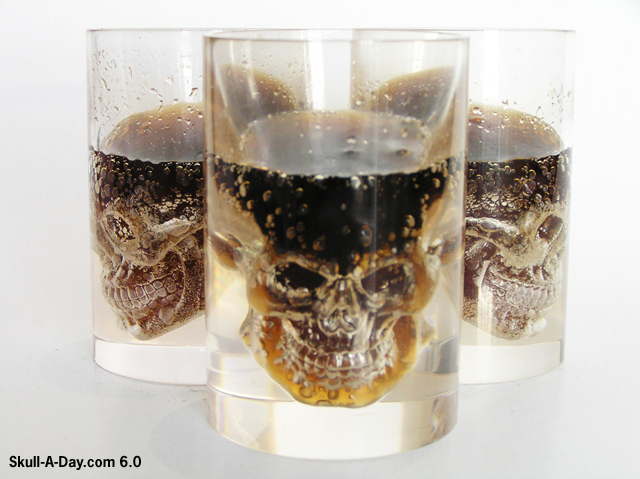 You can always be a real winner by purchasing your own skull glass here. Thanks again to PrzemO.o from the Cute Cube Collective! After visiting South America, joining a street art project mosaicing the streets of Brazil, and spending time with shamans in Peru, Lauren Baker had an epiphany of becoming an artist. 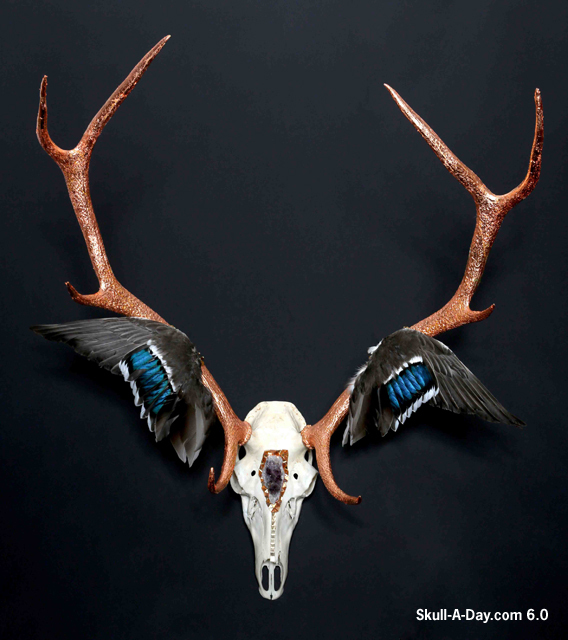 She started using ethically sourced animal skulls, paint, tiles, and other embellishments to pay homage to the living creatures. 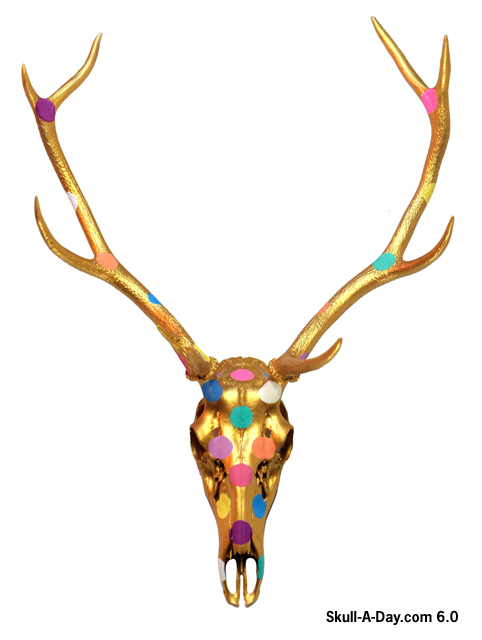 Each piece is unique and breathes it's own life back into the skull with amazing color and vibrancy. You can see that Lauren uses quite a few methods and techniques which is an awesome way of keeping things fresh and creative. Thanks for sharing the excellent works, Lauren! Artist, Brad Pearson in Richmond, VA challenges us to another game with some new skull themed marbles he made recently. 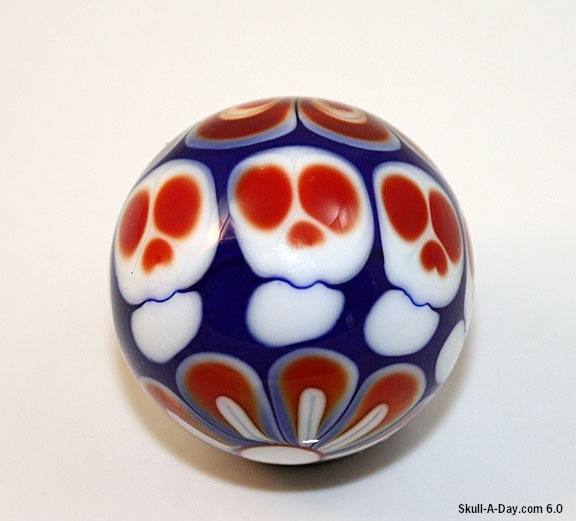 He wrote: "All this work is made at my RVA studio, and was made using lampworking techniques. 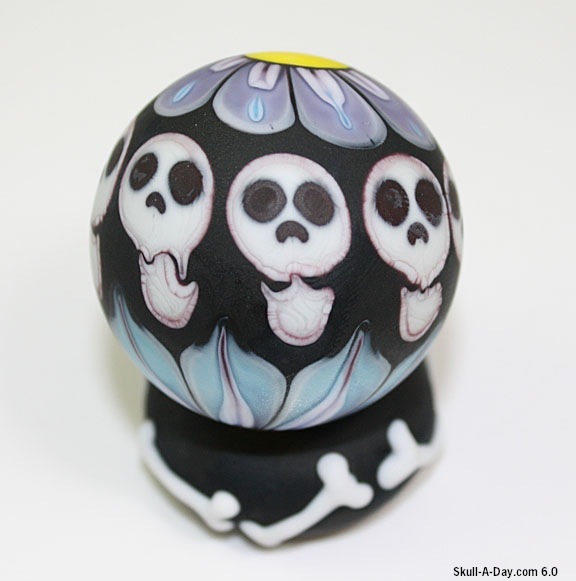 I draw a lot of the inspiration for these from the day of the dead motifs." Thank you once again for sharing some of your excellent work with us. It is always wonderful to see artists working in the ancient mediums. "Lo and behold, DROP DEAD, the unique collector’s item. DROP DEAD is the offspring of our passion and resolve. It is the child of the Cute Cube Collective, a creative group of people in possession of arcane knowledge, gathered by countless generations of alchemists. One of a kind. The mysterious alembic. Vas Hermetis." "The item was designed and produced in Poland through an extremely complicated casting process. Each copy is cast manually, and subsequently manually polished by a master craftsman. Made out of high quality crystalline resins. Cold to the touch. Volume of 250 ml. Cylindrical in shape. 7 cm in diameter, 10 cm in height. The experience of the family casting workshop makes it certain, that this item may be called a true piece of applied art." "Fill it with whatever it is you crave. An elixir of eternal life, virgin’s milk, maybe? If not, then alcohol will do! When an ominous skull appears before you, stare deeply into its eye sockets. See your own self, in articulo mortis. Treat the item with reverence. If necessary, clean it with lukewarm water. Dry it with a soft rag. Do not use hard sponges or metallic dishrags under any circumstance. Also, don't leave it with the regular dishware; show it off in a display cabinet. Use it only when making the most extraordinary of toasts." 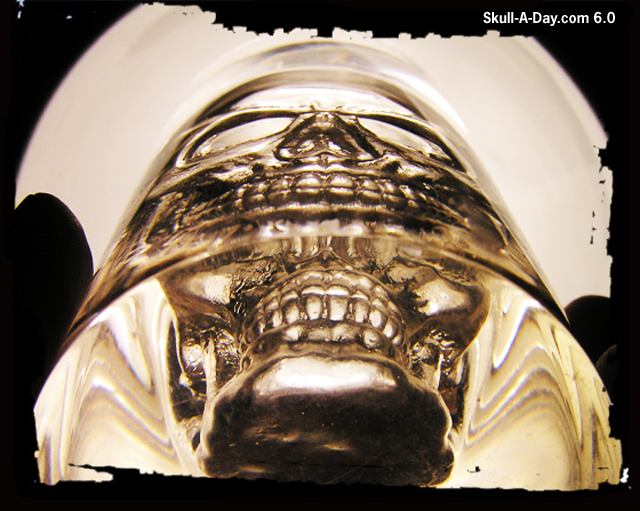 PRIZE INFO: One (1) Drop Dead Skull Glass as described above. HOW TO ENTER: It's been said that drinking from someone's skull lets you partake in their knowledge and wisdom. Leave a comment below stating whose knowledge you would drink from this glass if you could choose anyone from any point in time. I would have to do a coin flip between Albert Einstein and Ghandi. CONTACT INFO: If you win, we need to contact you. With your comment, please include your email, or make sure your Blogger profile has a working email link for you on it. Entries are only valid with this information. CONTEST CLOSES: 11:59:59 PM Eastern Time Wednesday, January 2nd. 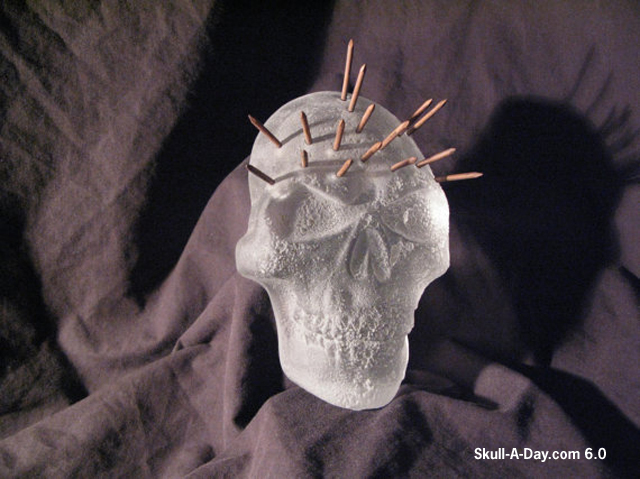 PRIZE SHIPS: This contest is open to all skull lovers around the world. You can "Drop Dead" no matter where you live. 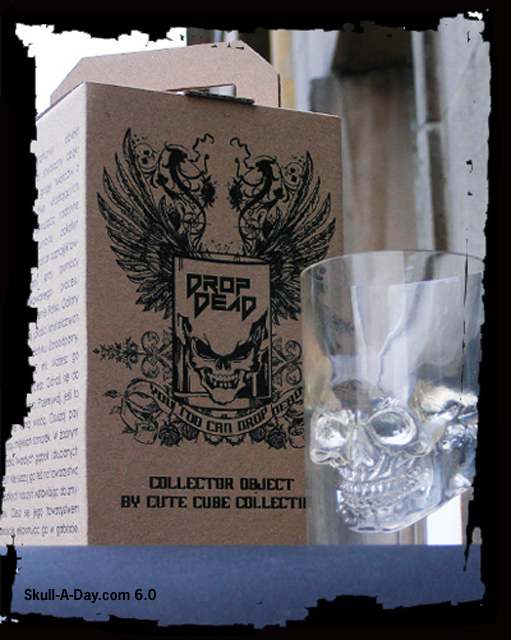 IF YOU DON'T WIN: You can always "Drop Dead" too by purchasing a Drop Dead Skull Glass via the store here. They do ship from Poland so be sure to inquire about exchange rates and costs (approx $32 USD). Many thanks for the awesome giveaway to PrzemO.o from the Cute Cube Collective! 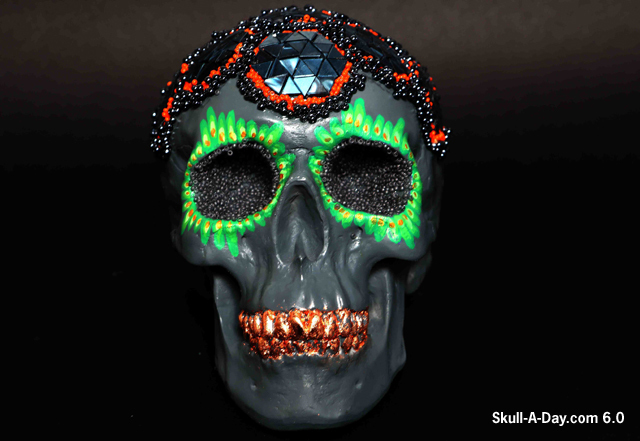 Maria Burke and Denise Corcoran paid homage to Noah Scalin by making this skull. Noah was a keynote speaker at the Virginia Arts Education Association annual meeting in Norfolk, VA. Maria and Denise were attendees. If you aren't familiar with Norfolk, VA, I'll tell you now, it's along the VA coastline...aka by beaches. If my memory serves me right, the objects they used are stingray or skate egg cases. 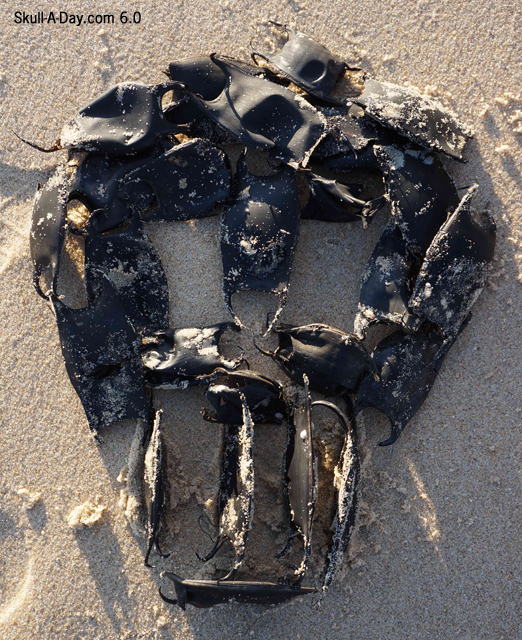 They commonly wash up along our beaches. Most are empty, but because the cases are so light weight, the tide will pull them up onto the beach. The next time you see some, gather them up and make something for others to see. Returning** Artist Natalie VonRaven AKA "Magisterian", from Alberta, Canada showed off a pair of paintings she created. She wrote: "I am a full time painter and artisan. 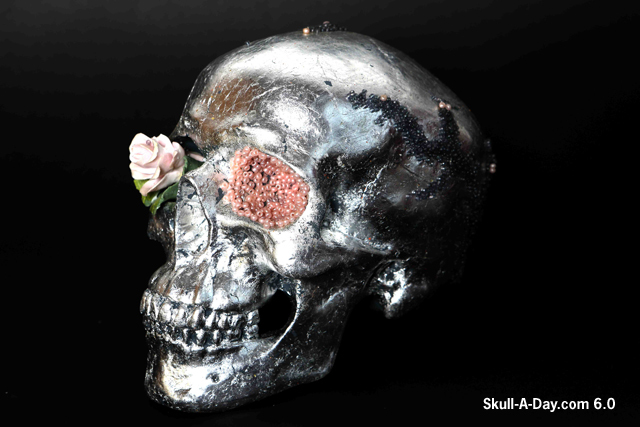 My primary focus is on gothic/fantasy/surreal themes, portraits and...SKULLS!" Medium: Acrylic Size: 5"x 7"
Medium: Acrylic Size: 9"x 12"
At this time of the years it is always nice to catch up with old friends. we don't always get sizes that go along with submitted work. It was nice to get of feeling of perspective on your pieces. Thank You once again for sharing your work with us. ** You can visit another of her posted submissions HERE. THIS CONTEST IS CLOSED! Thanks to everyone who participated! Don't forget that you have until 11:59:59 PM Eastern Time Wednesday, December 26th to enter our latest giveaway contest for a set of 2 Skull Ornaments from Laura Bartholomew. You can find the original contest posts here or by clicking the side bar ad. Of course, Laura's beautiful Dia de los Muertos wood and porcelain glass ornaments are available for purchase in her Etsy shop ARTholomew. Also, she's offering a 10% discount on all purchases if you enter SKULL10 at check out! This "Hellmet" skull painting comes from my friend Eric Britton of Eville Paint out of Grand Rapids, MI. 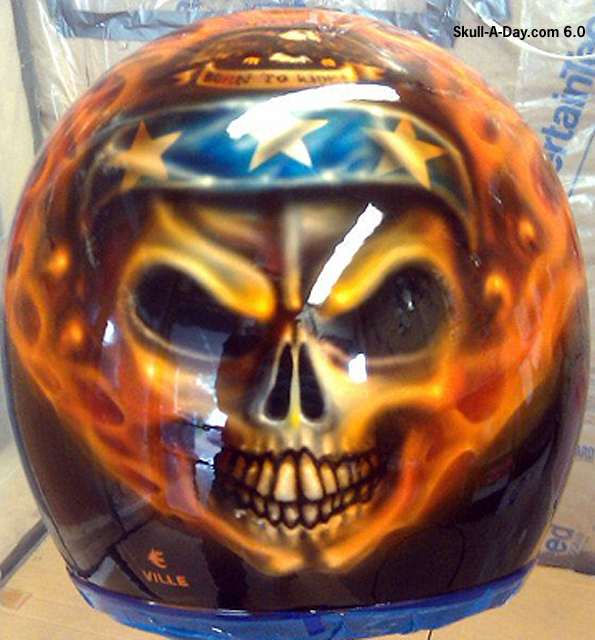 Some badass airbrushing for your holiday! I hope this makes for a nice Christmas surprise for my friend that I haven't seen in a while. I hope all of my friends are safe and happy this holiday season. Thanks for the sweet submission, Eric! Merry Hanuwanzaa! 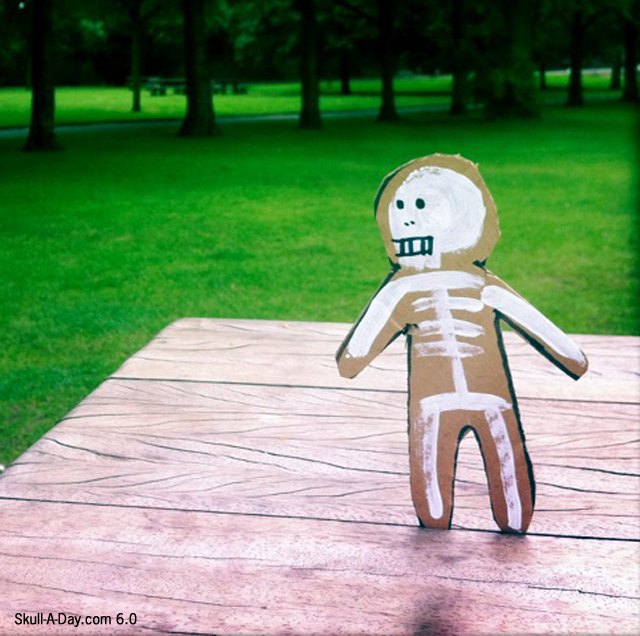 Barry Baxter "made a bunch of recycled cardboard skeletons. Then left them in public places so people could take them home." 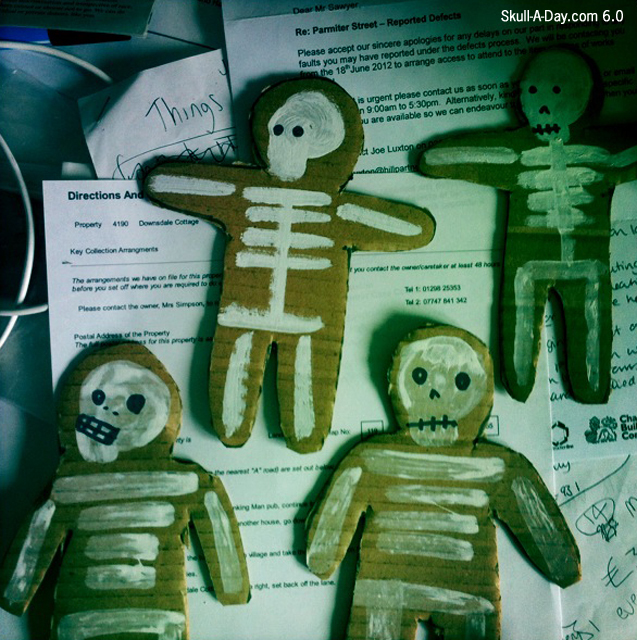 The 1st thing that popped into my head when I saw this was gingerbread people! Granted they aren't, but since they resemble the festive cookies, I thought it was best to share them on Christmas Eve. Thought, they are great for any Winter holiday celebration. My family always starts the holiday celebrations on Christmas Eve. We plan on decorating gingerbread people and houses tonight while dinner is cooking. I hope you all have a fantastic time at any of your end of the year celebrations. Perhaps fit making a skull into the celebration. Today's simulacra are seasonally festive. 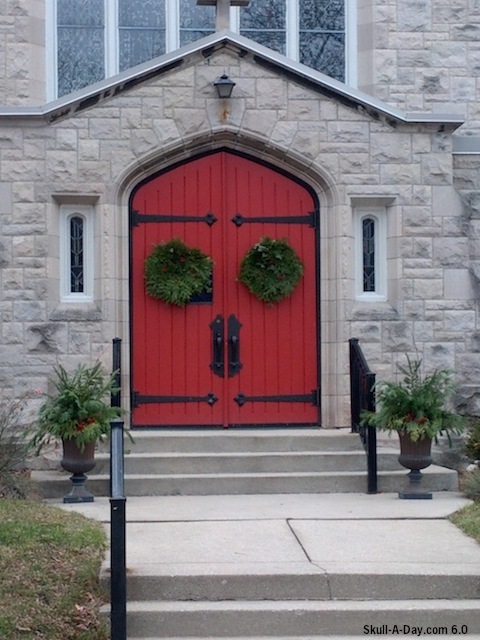 First up we have Andy who wrote: "Here is a pic of the front door of a local church north of Milwaukee, WI." 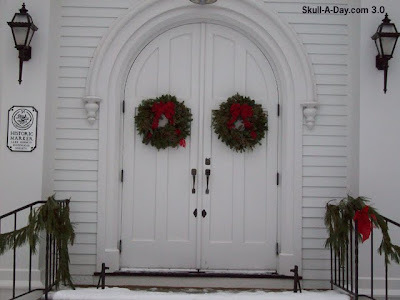 Samantha Griff of Kirtland, Ohio told us, "I saw this festive skull on the front doors of a small historic church." Thank you both for sharing your simulacra with us. I feel like this is one of those spreads from a fashion magazine where it asks the readers to choose "Who wore it best?". Wait, on second thought if you feel like commenting... I would love to hear some thoughts on the matter. 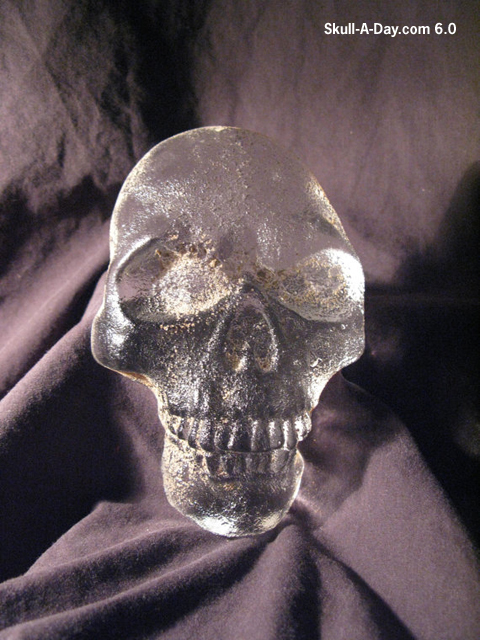 Glass artist, Mike Eader of Seattle, WA is here with his glass skulls that he created by making a sand casting mold and hot glass that he pours into place. They measure 7 inches long by 4 inches wide. Some get sandblasted and some are adorned with copper nails. Glass happens to be one of my favorite mediums to see, but sometimes it can be fragile and finicky, which makes it that much more impressive when done done right. 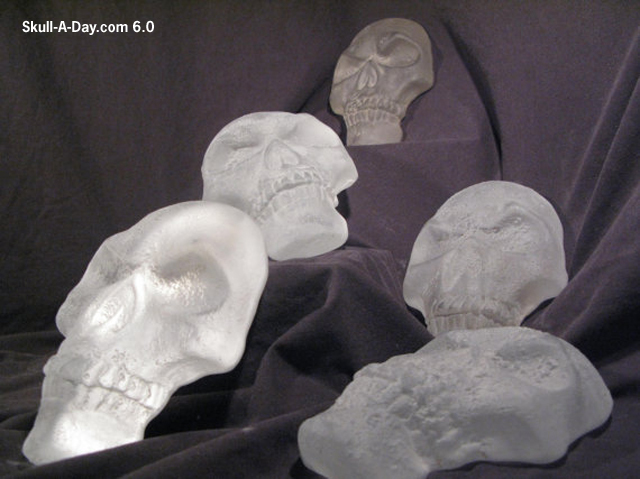 These skulls look fairly solid and heavy and rock with their 3 dimensional features. The addition of the nails is a brutally awesome look. I do wonder what one could do by etching designs on the face of these. Infinite possibilities! Thanks for the great submission, Mike! THIS CONTEST IS CLOSED! Thanks to everyone who participated. 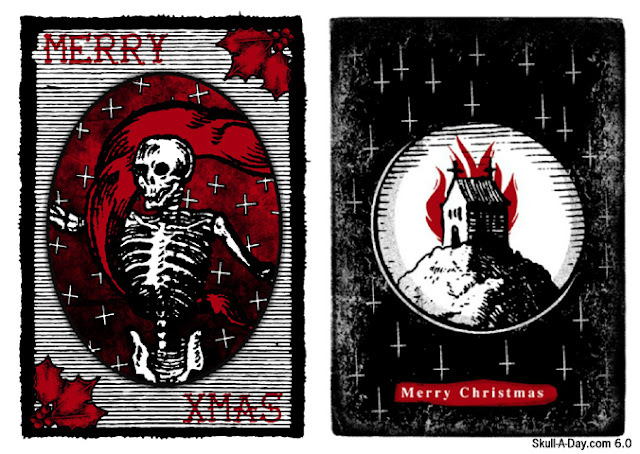 Don't forget that you have until 11:59:59 PM Eastern Time TONIGHT to enter our latest giveaway contest for a set of 5 Occult Christmas Cards from Sean Tidy. Of course, Sean's Occult Christmas cards are available for purchase in his store. The are available in sets of 5 and 10, or sold individually. Don't miss out! Denver, CO artist P78 of Thicket & Brush shared one of the pieces of his recent semi-daily work with us. glad you folks are doing what you do." 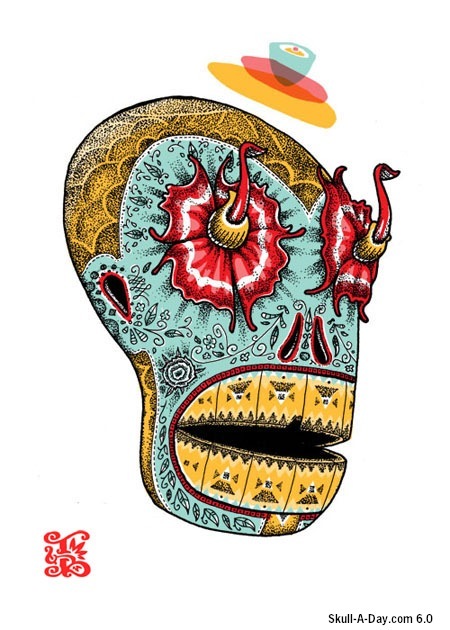 Thank you for finding us, you have an interesting style to your work and I really enjoy the range of colors and shapes you work with in creating your skulls. Keep up the pace with your regular (daily) work, it is always nice to know that we have the power to inspire, and now you have the pleasure of sharing your power with the next artist out there that finds the site. 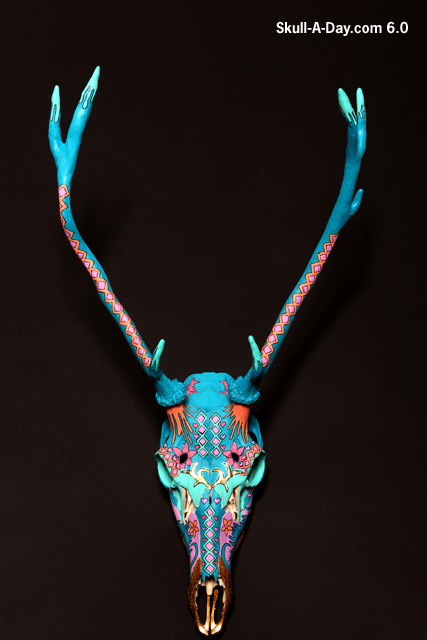 Laura Bartholomew is an artist and designer specializing in Day of the Dead inspired artwork. She works primarily in pyrography (wood burning) and acrylic paint. Laura's work can be seen on her website, Facebook page, and in her Etsy shop ARTholomew. 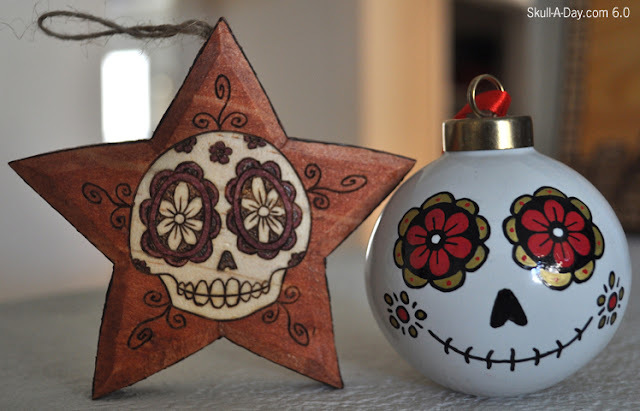 Since it is the Winter holidays season, Laura is giving away a set of two ornaments, one wood burned star and one porcelain glass painted ball, to one lucky Skull-A-Day fan! PRIZE INFO: One set of two ornaments...one painted porcelain glass ball, and one wood burned and stained star. HOW TO ENTER: Leave a comment below telling us how you decorate for any Winter holiday. For example, I decorate my front porch with many decorative Winter things, but the inside of my home just gets stockings and small ornaments on the mantle. CONTEST CLOSES: 11:59:59 PM Eastern Time Wednesday, December 26th. IF YOU DON'T WIN: Head on over to Laura's Etsy Shop, ARTholomew. She has many ornaments and other pieces of artwork in there. Also, she's offering a 10% discount on all purchases if you enter SKULL10 at check out! Jason Gogerty and his partner painted their faces for this year's, Dia de los Muertos celebration at the Hollywood Forever Cemetery. The makeup application took about 1.5 hours. I love seeing Jason and his partner return with more amazing makeup. We don't get many submissions from guys with skull makeup, so I always enjoy this sort of surprise. 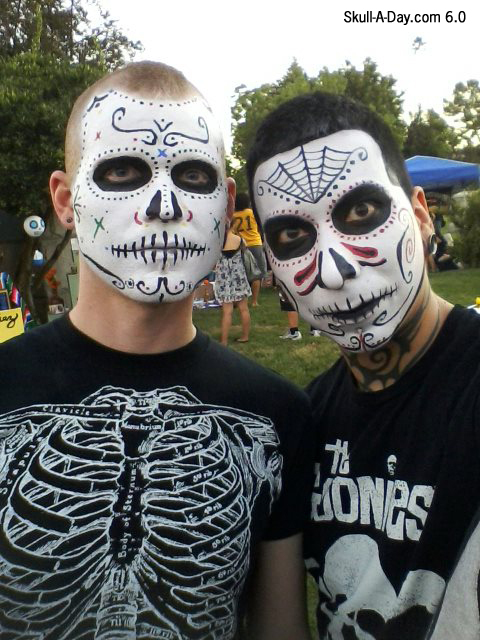 I especially enjoy seeing that these two guys are still painting their faces for a Dia de los Muertos celebration! Fantastic work that I hope to see again! Adrian Edger, the artist who began 400 Skulls in September 2011 showed off a pair of his paintings to us. Congratulations on such a grand undertaking. I would have never imagined being able to commit to a project that will take 33 years to complete. Thank you for sharing your work with us and make sure you check in with us each year so we can watch your progress. Don't forget that you have until 11:59:59 PM Eastern Time Saturday, December 22nd to enter our latest giveaway contest for a set of 5 Occult Christmas Cards from Sean Tidy. This contest has ended. Thanks to everyone who left a comment to enter. Don't forget that you have until 11:59:59 PM Eastern Time TONIGHT to enter our latest giveaway contest for a "Skull Brain" from Emilio Garcia. Of course you can always put your own brain to good use by visiting Emilio's Fine Art Shop. You can find the Skull Brain and Jumping Brain there with a variety of options. Thanks again for the chance to free our minds, Emilio! 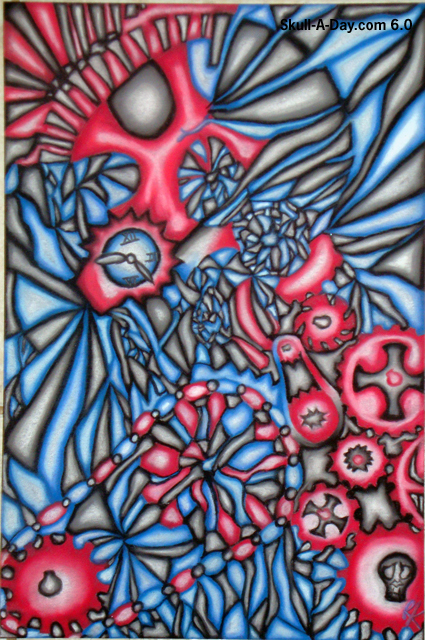 This chalk pastel work from Ryan Kinney titled "Mirrors and Gears" is Ryan's representation of the inner workings of the human mind. This piece is as complex as it should be. The human mind is almost as vast as the universe. We'll never fully understand it until we know how every part of it works. Even scientists can do all of the testing they want, but there will always be someone you see that makes you wonder, "What are they thinking?!?" Thanks for the great work, Ryan! 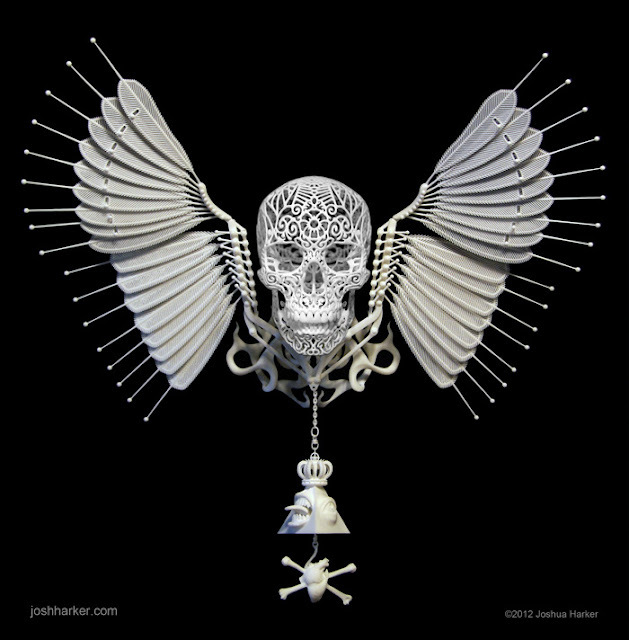 There's just one week left to support artist (and Skull-A-Day sponsor) Joshua Harker and the Kickstarter for his latest amazing sculpture! Want to have one of these amazing pieces in your home? Check out the Kickstarter page HERE. I recently had the honor of visiting Doha, Qatar to speak at the 10th anniversary celebration of Creative Commons. It was my first visit to the city and I only had one day to explore the area, but luckily my host and two of her co-workers agreed to take me on a tour. Since my talk was about creating the Skull-A-Day project, my hosts were enthusiastic about my creating a skull during the trip! 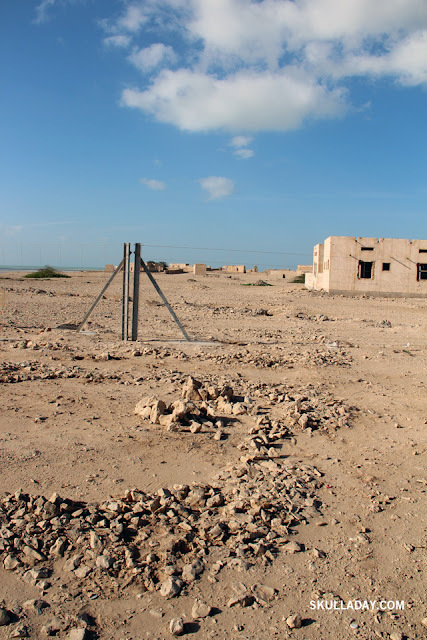 I kept an eye out for opportunities as we drove around and at the northern most tip of the country we visited an archeological site which just happened to have vaguely skull shaped clearing outside the fence protecting it. 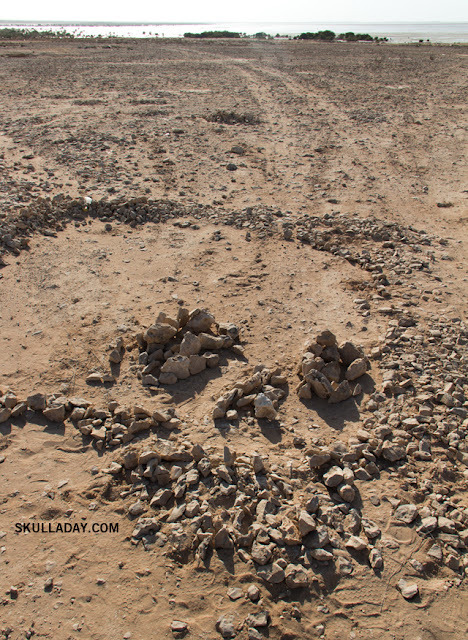 Over the course of an hour, and with the help of my hosts, I arranged a few rock piles to create the nose and eyes. It ended up being such a large skull (about 15 feet (4.6m) tall) that I had to stand in a truck bed to capture it from above! Thanks again to my Qatari friends for their hospitality! Sheleen McElhinney from Feasterville, PA took this photo of herself on Halloween. 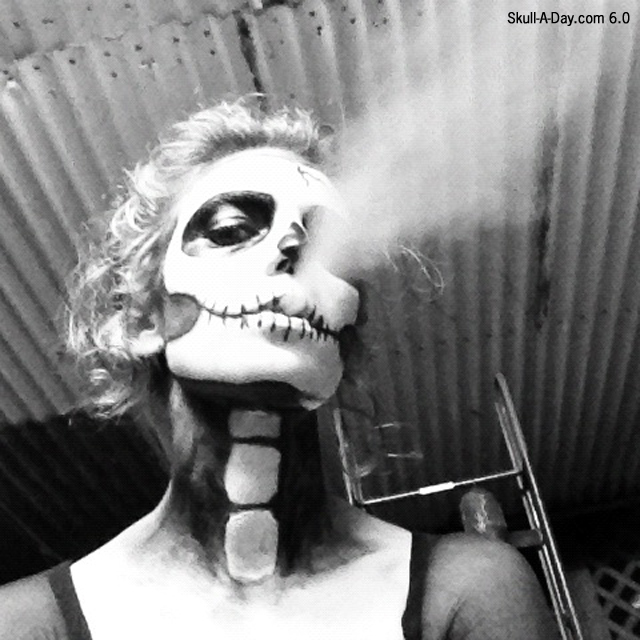 The angle of this photo makes the lovely skeleton makeup look sultry. Thought each skull makeup I see is unique, it's the style of the photo that draws me in. Oddly the angle of the photo and the style of makeup also make it feel natural, as if Sheleen always looks like this. Of course, she doesn't, but it's fun to pretend. Today's simulacra are found between a rock and a Good place. Frequent simulacra hunter, President Wishnack from San Fransico, CA said: "It's been a while since I've submitted a skull. 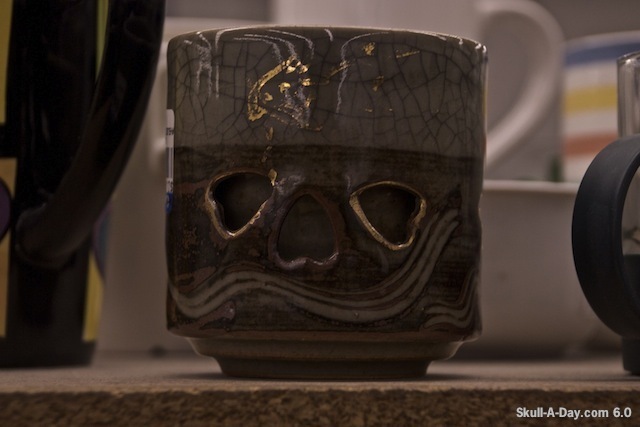 I found this mug at Goodwill, and I don't think it was intended to be a skull-- it's got three hearts on all sides of the mug. This side looks like a confused skull to me." Next Marzi, caught this simulacra on 1st Street in Austin, TX. Thank you both for taking the time to submit your finds. You never know when one may decide to say hello so remember to keep your cameras at the ready. Sean Tidy was unsatisfied with the same old Christmas cards he saw in shops, so he decided to make his own. He said, "They are a fun twist on classic Christmas themes, with a little black metal, church burning sprinkled on top." These are definitely not your average Christmas cards. 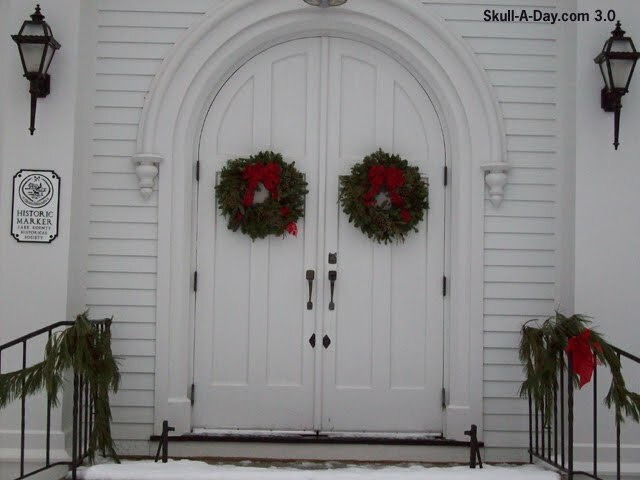 They have skulls, skeletons, and some dark occult elements that remind me of other culture's Christmas stories. Sean wants to share his unusual Occult Christmas cards with you all. He's giving away a set of 5 cards to one lucky Skull-A-Day fan! 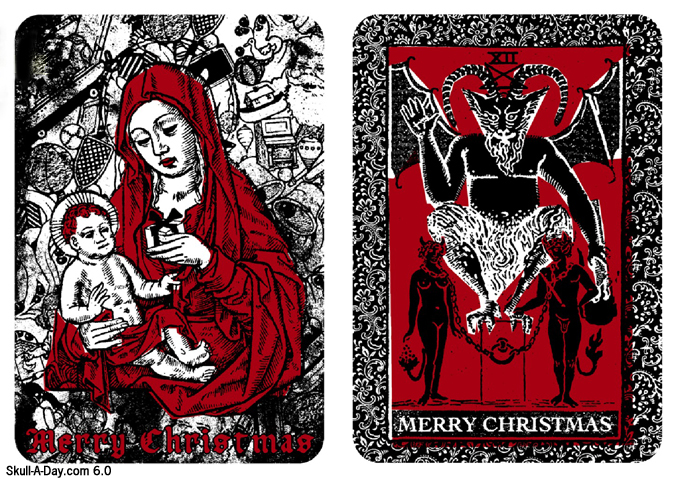 PRIZE INFO: One set of five Occult Christmas cards (one of each design). Each card comes with a brown, ribbed envelope, and they are individually wrapped in cellophane. HOW TO ENTER: Leave a comment below telling us what unusual Winter holiday traditions you do. For example, my family opens all their presents on Christmas Eve vs. Christmas morning. "Santa" brings the kids more presents the following morning. CONTEST CLOSES: 11:59:59 PM Eastern Time Saturday, December 22nd. IF YOU DON'T WIN: Don't fret. 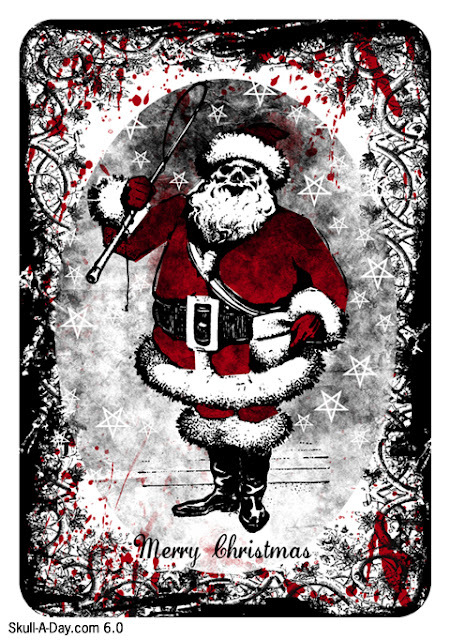 Sean's Occult Christmas cards are available for purchase in his store. The are available in sets of 5 and 10, or sold individually. Also, you can see more of Sean's artwork on his Website and Facebook page. "la Paz felicidad amor (peace love happiness)"